There was a time when it seemed as if protecting the earth and raising a family just didn’t mix. I wanted to stop using juice boxes, processed foods, and plastic shopping bags. I would read stories of zero waste families and feel inspired and determined. Until I found myself at the cash register without my cloth shopping bags AGAIN! Even though I’d put the wretched things on the doorknob as a reminder. And waltzed right past them on my way to the grocery store! 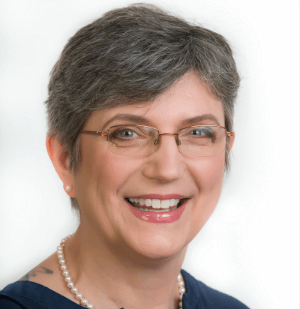 As a parent I can’t help but worry about how climate change, pollutants, and floating islands of plastic trash will affect my children and grandchildren’s health and future. Despite these concerns going green can seem totally overwhelming when you’ve got lunches to pack, schedules to keep, and a lengthy class list for Valentine’s Day. 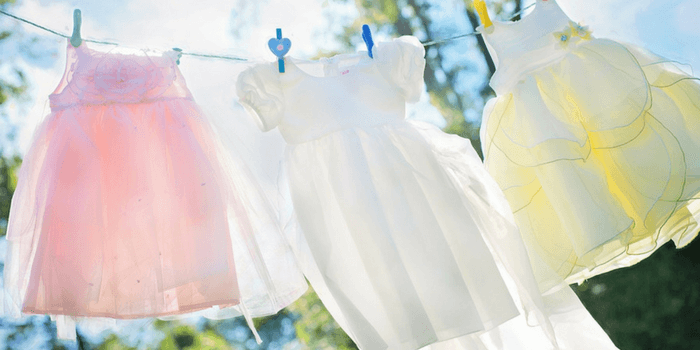 Still I have found some baby steps that helped my family be more environmentally conscious. 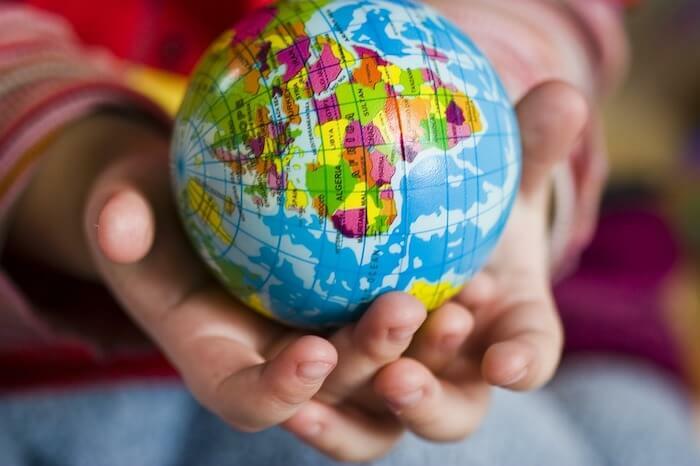 These family-friendly strategies will help you begin to care for the earth without it being too burdensome. Eco-friendly habits have a way of being frugal. In fact 9 times out of 10 they will help you save money. 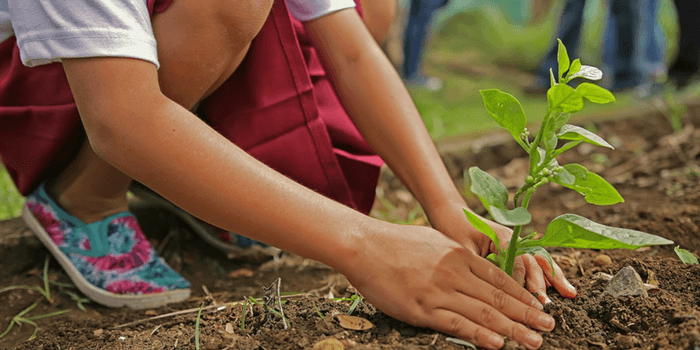 Most kids really care about the environment, so going green makes a great family project. Your kids get to make a difference and you get to do something worthwhile WITH them. If your children get used to green living now, it’ll be something that comes naturally when they’re adults. Then they will pass that way of living down to their children OUR grandchildren. There are so many little things we can do in our homes to play our part in reducing landfill waste, cleaning the air, and preserving our earth. Here are some small, easy, green choices we can make in our homes. These changes are pretty simple and shouldn’t be too burdensome. How about you pick one or two that you’re not already doing and start doing them this year. Wash laundry in cold water instead of hot. Who knew it was so simple to care for the earth? Air dry your clothes. Our new home did not have a washing line and we had no handy posts, so we just bought this rotary clothesline. I can’t wait until the weather is warm enough to use it. In the winter we use a drying rack. It is a great way to add humidity into the air and much cheaper than the dryer. Ditch the laundry detergent for soap nuts. 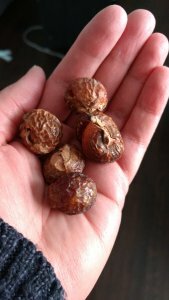 Soap nuts are a natural, biodegradable and petroleum-free laundry soap alternative. They grow on trees in Nepal and India and contain a natural soap called saponin. Place four or five of them, in a small cloth bag, to a load of dirty laundry. You can reuse that pouch of soap nuts for 5-6 washes. I was very dubious when I first heard about these things. I couldn’t see how they would work, but I gave them a try. It was amazing! These small nuts are miracle workers and get my laundry clean every time. After about 6 washes they go into the compost. You can buy them here. Use reusable lunch and snack bags. I use these every day. I love the fact that they are BPA, PVC, Vinyl, and Lead free. They can also be tossed in the laundry. Buy an inexpensive reusable water bottle, and stop buying plastic bottles. I’ve had my bottle for years and it is no longer available. I’ve heard good things about this one. Put up a solitary bee nest. Amidst growing concerns of declining bee hive populations, solitary bees are increasingly important for plant pollination. Unfortunately their numbers are declining due to a lack of suitable nesting locations. Nests provide a safe place to lay their eggs. There are many solitary bee nests available, but many of them are not actually safe for the bees to use. This particular nest has been approved by the Xerces Society for Invertebrate Conservation and works really well in our garden. Canadian readers you can purchase this at Lee Valley Tools. Plant something! Trees filter carbon out of the air and produce oxygen. Home grown vegetables and fruits give you organic foodstuff and don’t have to be trucked in. Don’t have time to create a vegetable garden? Plant a few things in containers to harvest throughout the growing season. Use a composter. We bought this one –it is expensive, but works really well. Make a cheap one for the cost of a trash can. Collect rainwater, and use it to water your houseplants and garden. Some municipalities give rebates for rain barrels it’s worth checking to see if yours has such a program. Before buying anything new, first check your local thrift shop, Craigslist or Freecycle. If it is a something you will only use for one job consider renting or borrowing from a friend. Cancel your newspaper subscription and read the news online instead. See if your library subscribes to Press Reader. Join the library and start borrowing books, magazines, movies, audio books. Many libraries now offer digital resources like e-books, digital magazines, streaming movies and music. Switch all your light bulbs to those that use less electricity (or at least switch a few). Compact Florescent light bulbs work well but we prefer LED lights as they do not get hot as CFLs and you can get bulbs that work with dimmer switches. Research whether you can sign with a utility company that provides green power. We use Alberta Co-operative Energy. Lower the temperature on your hot water heater and thermostat. Use a programmable thermostat control. Why heat an empty house? We’ve set ours to go down to 6o while we are at work and at night when we are tucked up in our cosy bed. Stop Junk Mail. It only takes a few minutes makes a huge difference! Worried you’ll miss out on the sales? Most stores have digital versions of their flyers. In Canada you just have to make a request at the local Canada Post office and they’ll stop delivering junk mail to your box. I’d love to hear from readers in other countries. How can you stop junk mail in Europe or Australia? Switch from paper napkins to cloth ones. 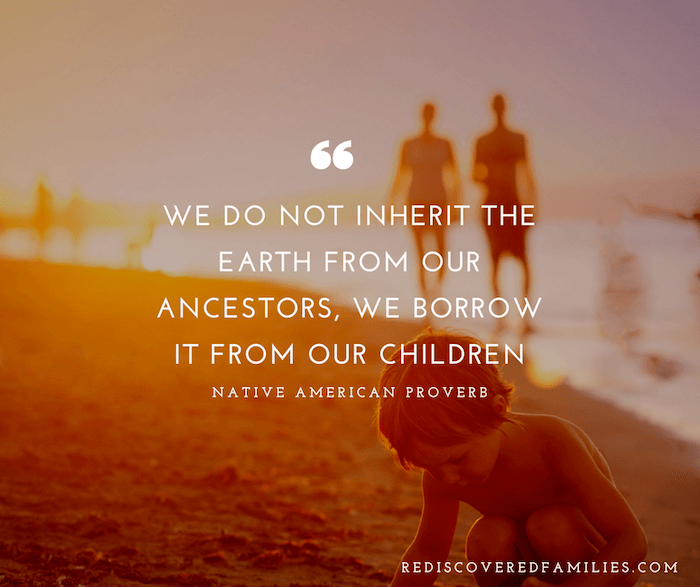 Are you inspired to take one baby step towards a green lifestyle with your family? Can you pick just one of these ideas and put it into action this week? Don’t forget to get the whole family involved by enlisting the help of your children. 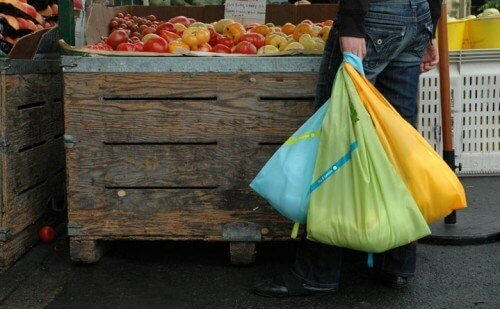 I’m going to try and remember to take my reusable shopping bags with me. If I could only find some bags that would follow me out of the door! 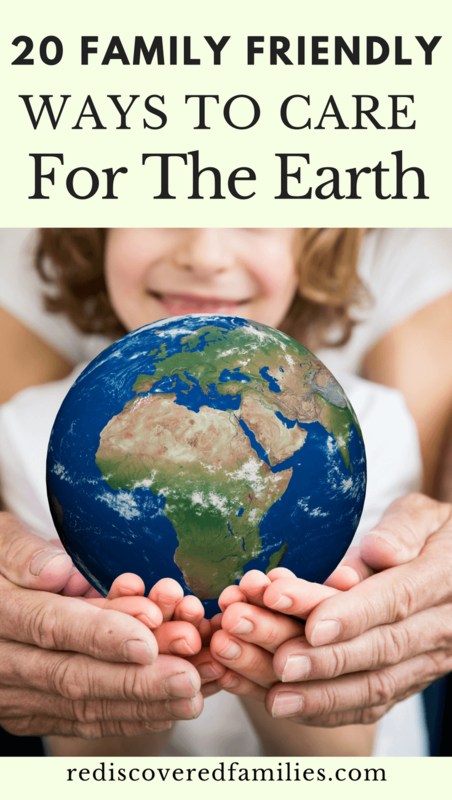 Does your family have other simple ways to care for the earth? I’d love to hear about them! Begin a green lifestyle by researching the household products you use every day to determine if they are safe for the environment. If any of the products are toxic to animals, birds, fish, plants, or the atmosphere, find an environmentally friendly alternative. One of the most common unsafe products that people use around is chlorine bleach. According to the US Environmental Protection Agency, chlorine bleach contains sodium hypochlorite which is a pesticide. Three alternatives to use in place of chlorine bleach are vinegar, baking soda, and hydrogen peroxide. Have each member of the family check all the faucets and outdoor spigots in your home. A dripping faucet is a huge waste of water and can really add up over time. Also, have family members turn off the water while they are brushing their teeth or doing the dishes. Turn the water on only when ready to rinse.